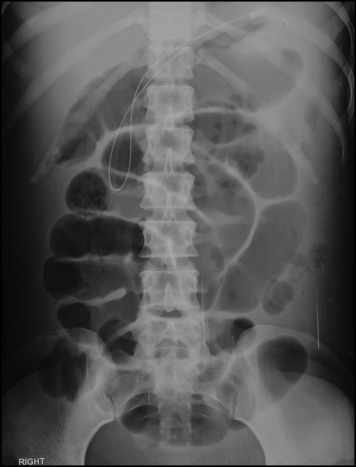 Abdominal radiograph (supine position) showing multiple air-filled, centrally located bowel loops. A 22-year-old student of engineering presented with a 2-week history of facial puffiness and pedal edema. Investigations revealed anemia, lymphopenia, urinary nephritic sediment, low complements, antinuclear antibodies with a homogenous pattern on immunofluorescence, and high titers of anti–double-stranded DNA antibodies. A renal biopsy was performed, and the results were uneventful. It confirmed class 4 lupus nephritis (National Institutes of Health Activity Index 10/24, Chronicity 1/12). One week later, she went to a surgeon elsewhere with severe abdominal pain, vomiting, and obstipation with progressive abdominal distension. She did not have melena. Examination revealed tachycardia with normal blood pressure and diffuse abdominal tenderness. Percussion revealed a periumbilical tympanitic note with dullness in the flanks suggestive of free fluid; bowel sounds were sluggish on auscultation. Because obstruction was suspected, a Ryle’s tube was inserted, and she was referred to the Sanjay Gandhi Postgraduate Institute of Medical Sciences. Nutrition was maintained intravenously. An x-ray of the abdomen in the supine posture showed centrally located air-filled small bowel loops, suggesting free fluid in the abdomen (Figure 1). 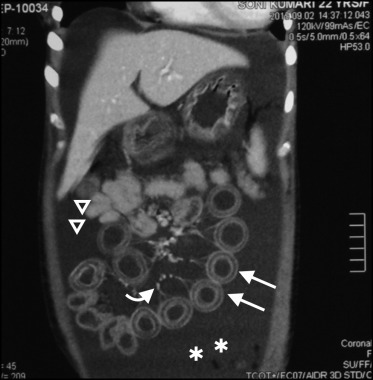 Computed tomography of the abdomen demonstrated the “target sign,” which signifies a diffusely edematous bowel wall with circumferential wall thickening (Figure 2). Ascites, pleural effusion, and loss of corticomedullary differentiation of the kidney were noticed. Computed tomography angiography revealed no evidence of venous or arterial thrombosis. Serum levels of amylase and lipase were not increased. Antiphospholipid antibodies were not present.